For a limited time, get FREE COPIES. Click here for details. This is a world of dwarves that look like garden gnomes and of star nosed moles with a fantastic system of logic. A world with truth tellers that seem like the biggest liars of all, and where things aren't always where they are. And of course it's a world where pixies hate being called fairies. This is the world of Lithaea, which two young brothers begin exploring after the entire place is lit up in a most unusual way. Where they discover, in the darkness of the Master's Cave, that their own world faces a coming Tribulation, and only by going up against unknown perils and tracking down The 7 can they do their part to change the future. One small problem: no one knows what or who The 7 are. Or where they are. Or whether they exist at all. This is a fast-paced, epic fantasy adventure written for older kids, teens, and even adults who haven't quite shaken off the wonder of life. Short chapters, 113 pages, and packed with humor and adventure. Plus 7 illustrations by kids! Want to help illustrate a future book? Have an adult subscribe to my blog where I'll post ALL the information about this series, including calls for future art. You can also submit your story ideas! 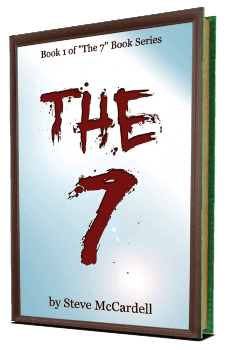 I hope you'll make The 7 part of your reading list and have your parents help you write a review on Amazon. Tell your friends about the book as well -- the more we can spread the word, the more magic I can work with this series, perhaps releasing apps (games) and other bonuses as a great big "thank you!"